Hot Time In the U. S. A. As global warming accelerates, average temperatures will climb. Above-average and record temperatures will become more common. “From the deserts of Arizona to the swamps of the Chesapeake, 2017 has already been a memorably scorching year—and it’s only half over. The first six months of 2017 were the second warmest on record for the contiguous U.S. (behind only 2012) in observations going back to 1895, according to NOAA’s national climate summary for June. The nation is well synched with the planet as a whole, which has been running second only to 2016 for its warmest year on record. “Four states sweated through their all-time warmest January-to-June period: North and South Carolina, Georgia, and Florida. Every one of the contiguous U.S. states has experienced a top-twelve-warmest year thus far, except for an eight-state arc running from California to the Dakotas.” –Bob Henson Weather Underground. CONTROL ROD DRIVE MECHANISMS OF 3 US NUCLEAR REACTORS CONTAMINATED WITH CHLORIDES because of a f-up by GE Hitachi during post refurbishment testing. THE REACTORS COULD FAIL TO SCRAM-shutdown or do so more slowly in an emergency or even create a nuclear emergency due to inability to control-shutdown the nuclear reaction. And what then to do? Scram yourself as far away as possible—ideally over 1000 miles away in the southern hemisphere where it will have less impact. 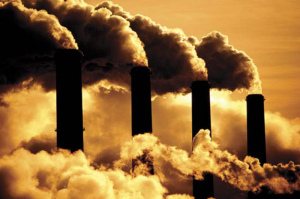 Greenhouse gas emissions from fossil fuel burning have leveled off. However, we are still emitting vast quantities. 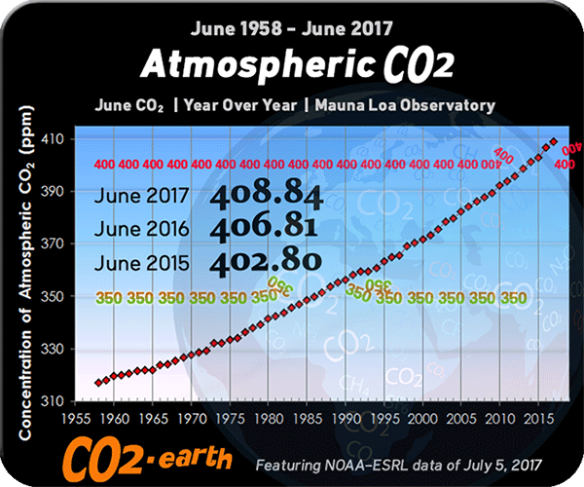 The CO2 we are continuing to emit adds to the amount of CO2 already in the atmosphere. Thus, the total amount of CO2 in Earth’s atmosphere is still rising. The chart below shows what’s happening. The total atmospheric CO2 is closely related to global average temperature. The continuing rise is why projections show that we will exceed 2 degrees C warming. A two degree temperature rise doesn’t sound like much, but it will have terrible effects. If you want to know what to expect,read this post that introduces an article from New York Magazine by David Wallace-Wells. Local residents and environmental groups have condemned a plan to release radioactive tritium from the crippled Fukushima nuclear plant into the Pacific Ocean. Officials of Tokyo Electric Power Co., the operator of the plant, say tritium poses little risk to human health and is quickly diluted by the ocean. In an interview with local media, Takashi Kawamura, chairman of TEPCO, said: “The decision has already been made.” He added, however, that the utility is waiting for approval from the Japanese government before going ahead with the plan and is seeking the understanding of local residents. The tritium is building up in water that has been used to cool three reactors that suffered fuel melt-downs after cooling equipment was destroyed in the magnitude 9 earthquake and tsunami that struck north-east Japan in March 2011. Around 770,000 tons of highly radioactive water is being stored in 580 tanks at the site. Many of the contaminants can be filtered out, but the technology does not presently exist to remove tritium from water. “This accident happened more than six years ago and the authorities should have been able to devise a way to remove the tritium instead of simply announcing that they are going to dump it into the ocean”, said Aileen Mioko-Smith, an anti-nuclear campaigner with Kyoto-based Green Action Japan. “They say that it will be safe because the ocean is large so it will be diluted, but that sets a precedent that can be copied, essentially permitting anyone to dump nuclear waste into our seas”, she told The Telegraph. “Releasing [tritium] into the sea will create a new wave of unfounded rumours, making all our efforts for naught”, Kanji Tachiya, head of a local fishing cooperative, told Kyodo News. Fukushima’s tritiated water to be dumped into sea, Tepco chief says. Does Tepco and Japan owns the Pacific Ocean? We were all just kidding when we said we would save our ocean. Besides, what’s a little bit more poison in the Pacific? Pretending to manage the unmanageable. Dumping into the ecosystem is simply standard operation. The solution to pollution is dilution.–old adage. Should all of us, all the other countries, stay silent while Tepco and Japan are deciding on their own to dump even more radioactive contamination into our Pacific Ocean? I would like to point out that the Pacific ocean does not belong to Japan, it belongs to all of us; as my dear friend Sheila Parks already pointed out in her excellent December 2013 article which I recommend to everyone to read, https://www.opednews.com/articles/The-Pacific-Ocean-Does-Not-by-Sheila-Parks-Energy-Nuclear_Fukushima_Fukushima-Cover-up_Japan-131215-303.html. Terrible, but tritium is actually released by all nuclear reactors. Legally and illegally, which reactor communities should point out every chance they get. Tritium (H3O) can go everywhere in your body water goes, even across the blood brain and placental barriers, and is thought to be a cause of elevated rates of childhood leukemia around nuclear reactors. An employee walks past storage tanks for contaminated water at the tsunami-crippled Fukushima No. 1 nuclear power plant of the Tokyo Electric Power Co. in Okuma, Fukushima Prefecture, in February. Tepco needs to release the water — which contains radioactive tritium that is not removable but considered not harmful in small amounts — into the Pacific Ocean, Chairman Takashi Kawamura said. As of July 6, about 777,000 tons were stored in about 580 tanks at the Fukushima plant, which is quickly running out of space. Tepco’s decision has local fishermen worried that their livelihood is at risk because the radioactive material will further mar public perceptions about the safety of their catches. Kawamura’s remarks are the first by the utility’s management on the sensitive matter. Since the March 2011 meltdowns were brought under control, the Fukushima No. 1 plant has been generating tons of toxic water that has been filling up hundreds of tanks at the tsunami-hit plant. Kawamura’s comments came at a time when a government panel is still debating how to deal with the tritium issue, including whether to dump it all into sea. Saying its next move is contingent on the panel’s decision, Kawamura hinted in the interview that Tepco will wait for the government’s decision before actually releasing the tainted water into the sea. “We cannot keep going if we do not have the support of the state” as well as Fukushima Prefecture and other stakeholders, he said. Toxic water at the plant is being treated by a complex water-processing system that can remove 62 different types of radioactive materials except tritium. Shunichi Tanaka, chairman of the Nuclear Regulation Authority, has been urging Tepco to release the water. Kawamura says he feels emboldened to have the support of the NRA chairman. But fishermen who make their livelihoods from sea life near the plant are opposed to the releases because of how the potential ramifications will affect their lives. “Releasing (tritium) into the sea will create a new wave of unfounded rumors, making our efforts all for naught,” said Kanji Tachiya, head of a local fishermen cooperative. On March 11, 2011, tsunami inundated the six-reactor plant, situated 10 meters above sea level, and flooded the power supply, causing a station blackout. The cooling systems of reactors 1, 2 and 3 were thus crippled, leading to core meltdowns that became the world’s worst nuclear disaster since Chernobyl in 1986. Water is being constantly injected into the leaking reactors to keep the molten fuel cool, creating tons of extremely toxic water 24/7. Although it is filtered through a complex processing system, extracting the tritium is virtually impossible. TOKYO (Reuters) – The owner of the wrecked Fukushima Daiichi nuclear power plant will push to resolve debate over the release of contaminated water from the site that has dragged on for years since the devastating 2011 quake, its new chairman said on Thursday. Tepco wants to release the tritium-laced water currently stored in hundreds of tanks at Fukushima into the ocean – common practice at normally operating nuclear plants – but the company is struggling to win approval from local fisherman. Tokyo Electric Power Co.’s new Chairman Takashi Kawamura speaks during an interview at the TEPCO headquarters in Tokyo on Thursday, July 13, 2017. Kawamura said the utility needs to stop dragging its feet on plans to dump massive amounts of treated but contaminated water into the sea and make more money if it’s ever going to succeed in cleaning up the mess left by meltdowns more than six years ago at the tsunami-hit Fukushima nuclear power plant. The new chairman of Tokyo Electric Power Co. says the utility needs to stop dragging its feet on plans to dump massive amounts of treated but contaminated water into the sea and to make more money if it’s ever going to succeed in cleaning up the mess left by meltdowns more than six years ago at the tsunami-hit Fukushima nuclear power plant. Takashi Kawamura, an engineer-turned-business leader who previously headed Hitachi’s transformation into a global conglomerate, is in charge of reviving TEPCO and leading the cleanup at the Fukushima Dai-Ichi plant. In an interview Thursday with selected media including The Associated Press, Kawamura said despite the massive costs of the cleanup and meeting tighter safety requirements, nuclear power is still vital for Japan’s national security. Kawamura says TEPCO must become more profitable to manage to cover the gargantuan costs of cleaning up Fukushima Dai-Ichi after it suffered multiple meltdowns due to the massive March 11, 2011, earthquake and tsunami. TEPCO’S longtime status as a regional monopoly undermined its profit-making incentive, hobbling its ability to cover most of the 21.5 trillion yen (about $190 billion) price tag for decommissioning the plant and compensating dislocated residents. “To reconstruct Fukushima, we must make more profit, and I know we should not be taking about just money, but I think that is important,” he said. Kawamura says he believes nuclear power is still a viable business and one that will continue to be vital for Japan’s energy security, despite the extra costs from stricter post-Fukushima safety requirements and the cost of processing spent fuel and waste. TEPCO is reviewing its business strategy, but based on rough estimates, “I still believe that nuclear is still superior for Japan, which is really a resource- poor country,” he said. “Even if we take severe accident measures and factor in spent fuel processing and other costs, I think there are some reactors that can still be profitable.” He said nuclear power includes a wide range of technologies that Japan should not abandon, for national security reasons, as China continues to build nuclear plants. Kawamura said TEPCO hopes to restart the utility’s Kashiwazaki-Kariwa nuclear plant in northern Japan, even while the decommissioning at Fukushima Dai-Ichi is underway, so the operable plant can be a major source of revenue for the company. He said a decision on whether to resume operation of the Fukushima Dai-Ni plant, near Fukushima Dai-Ichi, will depend on a financial review. He said he regrets TEPCO’s slowness in making a decision and acknowledged calls from local authorities and residents to decommission the second Fukushima plant, which was also hit by the tsunami but avoided a meltdown. Minamisoma, Fukushima Pref., July 12 (Jiji Press)–Minamisoma is still struggling with labor shortages, one year after the Japanese government lifted its nuclear evacuation advisory for part of the Fukushima Prefecture city. In the city, only slightly over 20 pct of residents have returned home, and the productive-age population of people aged 15-64 fell by some 8,200 from the level before the March 2011 meltdowns at Tokyo Electric Power Company Holdings Inc.’s <9501> disaster-crippled Fukushima No. 1 nuclear plant. The situation is “tough,” said Takuzo Tsuchida, a 58-year-old worker at a factory in the Kashima district that is run by a subsidiary of clothing maker Fukuso Co. The factory saw its number of employees halve to some 70. The Fukuso unit this year hired five graduates from a dressmaking school with which it held a joint fashion show last year. But the move was insufficient because some workers quit. To cover its lower output, the company has asked a partner factory for increased production. “We have to continue to put up with” the situation, Tsuchida said. The effects associated with long-term low-dose radiation exposure on fetuses are among the many health concerns. Children born to atomic bomb survivors from Hiroshima and Nagasaki showed low birth weight, high rates of microcephaly7, and reduced intelligence due to abnormal brain development8. Experiments with pregnant mice or rats and radiation exposure had been reported to cause low birth weight9, 10, microcephaly11,12,13, or both14, 15. We identified one similar study on wild animals16, which reported that the brains of birds captured in the vicinity of the Chernobyl NPP weighted lower compared to those of birds captured elsewhere. The population of Japanese monkeys in Fukushima City had been systematically managed since 2008 according to a management plan based on law and regulated by Fukushima Prefecture to reduce damage to agricultural crops. Our research group studied the reproductive and nutritional status of the Japanese monkey population by performing autopsies on individuals captured and euthanized by Fukushima City17. These Japanese monkeys were the first wild primate population exposed to radiation as result of nuclear disaster. However, there was no other study either in Chernobyl or Fukushima that followed fetal development over time or compared fetal development before and after long-term radiation exposure in the same wild animal populations. The objectives of this study were to compare changes in the fetal development of Japanese monkeys in Fukushima City before and after the NPP disaster to determine evidence of developmental delay in Japanese monkey fetuses. Radiocesium was detected in mothers’ muscle that had conceived after the NPP disaster (Table 1). Mean muscle radiocesium concentration was 1059 Bq/kg for mothers that mated in 2011 and gave birth in 2012 (n = 14), although the concentration decreased gradually in subsequent years up to 22 Bq/kg for mothers that gave birth in 2016 (n = 3). Because muscle tissue was not available prior to the NPP disaster, muscle radiocesium concentrations for individuals captured pre-disaster could not be measured. However, muscle radiocesium concentrations in wild Japanese monkeys captured in 2012 in Aomori Prefecture, which is also located in the Tōhoku region 400 km north from the NPP, were below the detection limit2, therefore, we assumed that the muscle radiocesium concentrations in the Japanese monkeys in Fukushima City prior to the disaster were also below the detection limit. Similarly, although the air dose in the area of Fukushima City inhabited by the Japanese monkeys was 1.1 to 1.2 µSv/h in April, 2011, it has decreased, reaching 0.10 to 0.13 µSv/h in May, 2016 (Table 2). Based on these measurements, it is estimated that monkeys in this area received accumulated air doses of at least 12 mSv over the five years since the NPP disaster. The descriptive statistics for Japanese monkey fetuses in Fukushima were shown in Table 3. The median body weight (g) and median body weight growth rate (g/mm) were significantly different between pre- and post-disaster groups (p = 0.032 and 0.0083, respectively). The mean biparietal diameter (mm), occipital frontal diameter (mm), head size (mm2), and proportional head size (mm) were significantly different between pre- and post-disaster groups (p = 0.046, 0.018, 0.014, and 0.0002, respectively). CRL was not significantly different between the two groups. Regression lines describing association of body weight and CRL in pre- and post-disaster groups were described in Fig. 1. Post-disaster regression line was significantly lower than pre-disaster regression line (p < 0.0001) (Table 4). Regression lines describing association of head size and CRL in pre- and post-disaster groups were described in Fig. 2. Post-disaster regression line was significantly lower than pre-disaster regression line (p < 0.0001) (Table 5). The body fat index for the mothers of these fetuses was not significantly different before and after the NPP disaster (Z = 1.213; P = 0.219). Body weight and head size relative to the CRL were lower in fetuses conceived after the NPP disaster compared with fetuses conceived prior to the NPP disaster. Japanese monkeys in Fukushima City first conceive in fall when they were five years old and gave birth in spring when they were six years old17. Thus, we assumed that all the mothers we examined that conceived babies after the NPP disaster were continuously exposed to radiation from at the time of the disaster in 2011. Growth retardation of the fetuses could be caused by the deterioration of the mothers’ nutritional status. However, we did not observe any difference in the body fat index of mothers pre- and post-NPP disaster. Therefore, the growth retardation of the fetuses was unlikely to be associated with to the mothers’ nutritional status. Other factors such as climate changes or food nutrient components might have affected the growth of fetuses. The limitations of this study were that we were not able to obtain samples to look at histological change that might have contributed to the cause of delayed fatal growth and the sample size were relatively small because of the nature of the sampling collection. It might have been ideal to compare monkeys from the evacuation order area to monkeys from the non-contaminated area of Fukushima; however, there was no other area such besides the one in this study that performed systematic large-scale capturing aimed at seizing hundreds of monkeys. In addition, there had been access limitations beyond the evacuation order area. For these reasons, it is impossible to replicate an equivalent study elsewhere at this time. In experiments using mice and rats, radiation exposure has been reported to cause reduced fetal weight, microcephaly, and reduced brain mass9,10,11,12,13,14,15. However, most of these experiments involved exposing the mother to a single radiation dose at a fetal age of 10 days or later when the brain undergoes development. Such exposure may be qualitatively different from the low-dose, long-term exposure following an NPP disaster. The radiation doses in these experiments varied substantially. Hande et al.9 exposed mice to 9 mGy of 70 kilo-Volt peak X-rays at fetal ages of 3.5, 6.5, and 11.5 days, and found that birth weight was reduced relative to the control mice in all cases. Uma Devi et al.15 exposed mice to 0.25 Gy at a fetal age of 11.5 days and observed reduced head size at birth. In addition, they observed negative correlation between radiation dose and head size in fetuses exposed to 0.05 to 0.15 Gy. The number of low birthweight children born to residents of some highly contaminated areas of Belarus increased between 1982 and 1990, after the Chernobyl NPP disaster18. Hujuel et al.19 conducted a longitudinal survey of women exposed to radiation through dental treatment who subsequently gave birth. They reported that women exposed to 0.4 mGy or more had increased risk (odds ratio 2.27) of giving birth to a child weighing 2500 g or less. Goldberg et al.20 elucidated the relationship between the level of radiation exposure as a result of medical exams prior to conception and birthweight, and found that birthweight decreased by 37.6 g for every cGy of exposure. Such medical exposure is believed to affect the mother’s gonads and endocrine glands rather than the fetus itself. There is still uncertainly to determine whether the retarded growth we observed was a direct effect of the radiation exposure. Otake and Schull8 conducted a temporal variation study of mothers exposed to radiation by the atomic bombs in Hiroshima and Nagasaki. They did not observe any effect in newborns that had been exposed between fetal ages of 0 to 8 weeks, and the highest rates of microcephaly and other brain damage occurred in newborns exposed between fetal ages of 8 to 15 weeks. Given that the latter period was when the human brain undergoes rapid development, damage due to radiation exposure during this period might cause severe effect on fetuses. The previous research suggested that the low birthweight and small head sizes observed in fetuses conceived after the NPP disaster were result of radiation exposure. However, we were not able to quantify the external and internal radiation dose in individual wild animals. Although radiocesium was detected in the muscles of all individuals captured after the NPP disaster, the cumulative exposure was unclear since the biological half-life of radiocesium in monkeys was approximately 3 weeks5. Furthermore, because of the small sample size, it was difficult to determine the causal relationship of exposure dosage and the effect on fetuses. Although we showed that fetal proportional head size reduced after the NPP disaster, it was not possible to identify anatomically which part of the brain was developmentally retarded. Hossain et al.12 studied the brains of 6- to 12-month-old mice that were exposed to cobalt 60 at a fetal age of 14 days. Brain weight decreased at exposure rates of 0.5 to 1.5 Gy and the number of neurons in the hypothalamus in the CA3 region decreased significantly. We started to perform histological examination brain of fetuses and juvenile monkeys conceived after the NPP disaster to identify the regions of the brain that were developmentally retarded and the effect of retarded growth on post-natal development for further study. 1, Akimoto, S. I. Morphological abnormalities in gall-forming aphids in a radiation-contaminated area near Fukushima Daiichi: selective impact of fallout? Ecology and Evolution. 4, 355–369 (2014). 2, Hiyama, A. et al. The biological impacts of the Fukushima nuclear accident on the pale grass blue butterfly. Scientific Reports. 2, 570, doi:10.1038/srep00570 (2012). 3, Suzuki, Y. Influences of radiation on carp from farm ponds in Fukushima. Journal of Radiation Research. 56, i19–23, doi:10.1093/jrr/rrv076 (2015). 4, Kubota, Y. et al. Chromosomal aberrations in wild mice captured in areas differentially contaminated by the Fukushima Dai-Ichi nuclear power plant accident. Environ. Sci. Technol. 49, 10074–10083 (2015). 5, Hayama, S. et al. Concentration of radiocesium in the wild Japanese monkey (Macaca fuscata) 15 months after the Fukushima Daiichi nuclear disaster. PLoS ONE. 8, e68530 (2013). 6, Ochiai, K. et al. Low blood cell counts in wild Japanese monkeys after the Fukushima Daiichi nuclear disaster. Scientific Reports. 4, 5793, doi:10.1038/srep05793 (2014). 7, Miller, R. W. & Blot, W. J. Small head size after in-utero exposure to atomic radiation. Lancet. 2, 784–787 (1972). 8, Otake, M. & Schull, W. J. In utero exposure to A-bomb radiation and mental retardation; a reassessment. Bri. J. Rdiol. 57, 409–414 (1984). 9, Hande, M. P., Uma Devi, P. & Jageta, G. C. Effect of “in utero” exposure to low dose energy X-rays on the postnatal development of mouse. J. Radiat. Res. 31, 354–360 (1990). 11, Uma Devi, P., Hossain, M. & Bisht, K. S. Effect of gamma radiation on fetal haemopoietic system in the mouse. Int. J. Radiat. Bio. 74, 639–646 (1998). 12, Bang, D.-w. et al. Dose-induce relationships on the prenatal effects of gamme-radiation in mice. J. Vet. Sci. 3, 7–11 (2002). 13, Hossain, M., Chetane, M. & Uma Devi, P. Late effect of prenatal irradiation on the hippocampal histology and brain weight in adult mice. Int. J. Devl. Neuroscience. 23, 307–313 (2005). 14, Uma Devi, P. & Hossain, M. Effect of early fetal irradiation on the postnatal development of mouse. Teratology. 64, 45–50 (2001). 15, Kim, S. H. et al. Dependance of malformation upon gestational age and exposed dose of gamma radiation. J. Radiat. 42, 255–264 (2001). 16, Uma Devi, P., Baskar, R. & Hande, M. P. Effect of exposure to low dose gamma radiation during late organogenesis in the mouse fetus. Radiat. Res. 138, 133–138 (1994). 17, Møller, A. P., Bonissoil-Alquati, A., Rudolfsen, G. & Mousseau, T. A. Chernobyl birds have smaller brains. PLoS ONE. 6, e16862 (2011). 18, Hayama, S., Nakiri, S. & Konno, F. Pregnancy rate and conception date in a wild population of Japanese monkeys. J. Vet. Med. Sci. 73, 809–812 (2011). 19, Peterova, A. et al. Morbidity in large cohort study of children born to mothers exposed to radiation from Chelnobyl. Stem Cells. 15(suppl 2), 141–150 (1997). 20, Hujoel, P. P., Bollen, A. M., Noonan, C. J. & del Aguila, M. A. Antepartum dental radiography and infant low birth weight. JAMA. 291, 1987–1993 (2004). 21, Goldberg, M. S., Mayo, N. E., Levy, A. R., Scott, S. C. & Poitras, B. Adverse reproductive outcomes among women exposed to low levels of ionizing radiation from diagnostic radiography for adolescent idiopathic scoliosis. Epidemiology. 9, 271–278 (1998). 22, Primate Research Institute, Kyoto University Guideline for fieled reserch for non–human primates. http://www.pri.kyoto-u.ac.jp/research/guide-e2008.html Accessed 28 January, 2017. 23, Japanese Ministry of Environment. 2012 Japanese Red List. http://www.env.go.jp/en/nature/biodiv/reddata.html Accessed 28 January, 2017. 24, Newell-Morris, L. L. Age determination in Macaque fetuses and neonates. Nursery care of nonhuman primates (ed. Ruppenthal, G. C.) 93–115 (Plenum Press, 1979). 25, Hayama, S., Mizutani, N., Morimitsu, Y., Shirai, K. & Nigi, H. Indices of body fat deposition in wild Japanese monkeys. Primate Res 14, 1–6 (1998). 26, Fukushima Prefecture website. Available: Results of air dose rate monitoring survey by Fukushima Prefecture. https://www.pref.fukushima.lg.jp/sec/16025d/monitaring-mesh.html Accessed 20 January, 2017. Boys And Their Toys: The Growing Movement Against Nuclear Nations https://newmatilda.com/2017/07/12/boys-and-their-toys-the-growing-movement-against-nuclear-nations/, By Sue Wareham on July 12, 2017 The case against nuclear weapons has always been strong. What’s changing is a growing global resolve to eliminate them, writes Dr Sue Wareham*. Nuclear weapons – the only man made threat that could virtually destroy our planet in an afternoon – have hit the news again, in two ways that represent polar opposites of the struggle to banish them forever. In New York at the United Nations we have just witnessed historic progress towards realising the goal of a nuclear weapons free world. Late last week, the UN adopted the new ‘Treaty on the Prohibition of Nuclear Weapons’, to prohibit states from developing, testing, producing, manufacturing, acquiring, possessing, stockpiling, transferring, deploying, stationing, using or threatening to use nuclear weapons, under any circumstances. That’s a fairly comprehensive thumbs down to the weapons, the strongest collective statement yet from governments that they are totally illegitimate in every respect. Meanwhile, in Washington DC and Pyongyang, two people – chronologically adults but in other respects displaying no signs of maturity – are squaring off at each other, each with a finger on a button that can incinerate cities. Donald Trump and Kim Jong-un display the very reason that the new UN treaty is so critically important, because it categorically rejects any role for any nuclear weapons in anyone’s hands. As Ban Ki-Moon, former UN Secretary-General said, “There are no right hands for the wrong weapons”. The treaty leaves no doubt that its prohibitions apply not only to actually using nuclear weapons but also to their possession. The myth of nuclear “deterrence”, which tells us that nuclear-armed nations will not go to war against each other because the response from their adversary would make it a suicidal gesture, is exposed as being not only immoral but also fraught with danger. Enter Trump and Kim Jong-un to demonstrate the point. If the deterrence theory holds true, why all the fuss now, when these two leaders clearly have it all under control? “Stable nuclear deterrence”, that notion so beloved of Australia and a minority of other governments, might sound comforting, but in the real world – a very messy place with some grossly deficient and unstable people – it’s a total fraud. Australia’s position is stark. Like a drunkard preaching abstinence, our government strongly supports US nuclear weapons in keeping us “safe” (even as officials scurry to reassure the public that North Korean nuclear missiles couldn’t really reach Australia) and insists shamelessly on disarmament for others. So supportive are we of US nuclear weapons that Australia did not even show up at the UN treaty talks. Foreign Minister Bishop disingenuously argued that, for the process to be effective, the countries with the weapons must be part of it right from the start. By that logic, we would insist on criminals helping draft any legislation that might curtail their activities. In any event, all UN member states were strongly encouraged to attend and have input; any empty seats were not from a lack of invitation. And judging by the determined – but unsuccessful – efforts on Australia’s part to see the talks fail, one suspects that our government knows exactly how powerful an instrument this global prohibition treaty will prove to be. Criticisms that the treaty will be a “toothless tiger” miss the whole point of it. The key to its utility was encapsulated last week by Tim Wright, the Asia-Pacific Director of ICAN*, the International Campaign to Abolish Nuclear Weapons, an organisation which played a pivotal role in achieving the treaty. As one example of this stigmatising effect, how different the discussion of Trident’s renewal in the UK might have been last year if the nuclear weapons submarines fell into the “illegal” category at that stage. A government voting to renew weapons that most of the world has prohibited would be one step too far, even for many of those stuck in a Cold War mindset. In the meantime, what do we do about North Korea, or, more to the point, about North Korea and the US? There is in fact plenty that could be done. Rather than turning up the volume on our echoes of Washington, Australia could urge a reduction of tension by the cessation of provocative military exercises by both sides. The North Korean leader has called for an end to US hostility and nuclear threats. Unless we regard the current situation as stable – nuclear deterrence just giving us a little fright as it tends to do – then an end to nuclear threats by both sides is absolutely critical. History is granting us another chance to get rid of what Indian writer Arundhati Roy called “the most anti-democratic, anti-national, anti-human, outright evil thing that man has ever made”. A strong civil society movement and a majority of the world’s governments working through the UN have just provided the best tool we’ve had for a long time with which to do this, a tool that delegitimises every one of the world’s 15,000 nuclear weapons. The stand-off between two dangerous nuclear-armed leaders, each of whom places his ego above the welfare of humanity, possibly even that of his own people, demonstrates that these weapons have no place in human society. * Dr Sue Wareham is the Vice-President of ICAN Australia. 14 July 2017 | As tensions build around the world, many countries have begun beefing up their defense capabilities to prepare for a nuclear threat. A new report found that warheads of magnitudes already owned by several major nuclear powers could trigger climate change as the resulting black ash causes temperatures to drop, leading to drought, famine, and billions of deaths. The researchers from the University of Nebraska-Lincoln investigated 19 types of weapons currently held by five major nuclear powers: the US, Russia, China, the United Kingdom, and France. ‘Thus, use of as few as 1 to 10 deployed nuclear weapons, and fewer than 25 of these prevalent types, from the five official nuclear weapons countries could produce a nuclear drought,’ the researchers warned in the new report.While the effects wouldn’t be as dramatic as those predicted in a ‘nuclear winter’ scenario, the resulting drought – also known as nuclear autumn – could have significant impacts around the world, the researcher say. The researchers note that the risk of widespread consequences kept the US and the Soviet Union in check during the Cold War.At the time, each nation recognized that a nuclear attack from either side would cause ultimately mutual destruction. Trump likely to say Iran complying with nuclear deal: U.S. official, WASHINGTON (Reuters) by Steve Holland and Jonathan Landay-13 July 17 U.S. President Donald Trump is “very likely” to state that Iran is adhering to its nuclear agreement although he continues to have reservations about it, a senior U.S. official said on Thursday. Under U.S. law, the State Department must notify Congress every 90 days of Iran’s compliance with the so-called Joint Comprehensive Plan of Action (JCPOA). Trump has a congressionally mandated deadline of Monday to decide. The landmark 2015 deal struck with Iran by the United States, France, Britain, Russia, China and Germany is aimed at preventing Tehran from developing a nuclear weapon by imposing time-limited restrictions and strict international monitoring on its nuclear program. In return, Tehran won relief from punishing international economic sanctions.